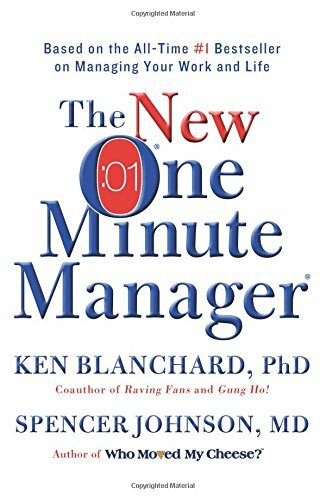 The New One Minute Manager by Ken Blanchard and Spencer Johnson. William Morrow. 2015. 98 pages. The authors also state that today people look for more fulfillment in their work, want to feel engaged and make meaningful contributions. The New One Minute Manager must use a new approach in this changing world. One Minute Re-Directs (a new version of the original third secret, a One Minute Reprimand). We believe in the 80/20 rule. That is, 80% of your really important results will come from 20% of your goals. So we set One Minute Goals on only that 20%—that is, our key areas of responsibility—maybe three to five goals. We used to be a top-down managed company, which worked in its time. But today that structure is too slow. It doesn’t inspire people and it stifles innovation. Customers demand quicker service and better products, so we need everyone to contribute their talent. The brainpower isn’t only in the executive office—it can be found throughout the organization. So I care about people and results, because they go hand in hand. Encourage people to take a minute to look at what they’re doing, and see if their behavior matches their goals. If it doesn’t, encourage them to re-think what they’re doing so they can realize their goals sooner. When he notices you have done something right, he tells you precisely what you did right, and how good he feels about it. Then he reinforces the praise by encouraging you to keep up the good work. Goals make clear what is most important to focus on, Praisings build confidence that helps you succeed, and Re-Directs address mistakes. And all three of these help people feel better about themselves and produce good results. Making mistakes is not the problem. It’s not learning from them that causes real problems.